I learned to knit about 13 years ago. I’ve picked it back up recently, teaching myself by doing research and just practicing. I’m excited to try this pattern! I was just wondering why this was knit using circular needles, since it is not knit in a round. Is it just because it is so large that it is easier to find circular needles long enough? This is an awesome looking blanket, and I can’t wait to try it for several baby blankets I am making for friends grandbabies. I have bought Bernat’s pipsqeak yarn which feels so yummy! The balls are 100 g/3.5 oz. and bulky yarn. Can you tell me how many balls of this yarn I need. and if I should stick with their recommendations of size 9 needles to make your baby blanket? Thanks for choosing my pattern to share the love with your friends’ grandbabies 🙂 I hope you have fun making it! I am unfamiliar with this yarn, but it sounds yummy. I checked on ravelry.com to see what needle size other knitters had used to make blankets with pipsqueak, and most of them used US size 13 needles. I would do the same. Oh my goodness. This looks so comfy! Wish me luck, will send picture when done. Thank you ! Can’t wait to see your blanket! Oh goodie! I finally found a pattern that I want to use for my Moda Dea Dream yarn. Hopefully it turns out! I’m still quite the beginner. Just wondering if you could explain the decorative edge part to me since I am pretty new at this. So you cast off the stitches from the blanket first and then start over by casting on stitches again? Then what? How do I attach the edging to the blanket? No problem! When starting the blanket cast on 122 stitches instead of 120. At the beginning of every row slip the first stitch purl-wise, work in pattern to last stitch, knit last stitch. HTH 😀 Welcome to the world of knitting! I am getting ready to do this for my best friend’s son and his wife who are expecting a baby in May. Saw that Anne use the Simply Soft using 2 strands. Did she use size 13 needles? Can’t wait to make it. Hello. 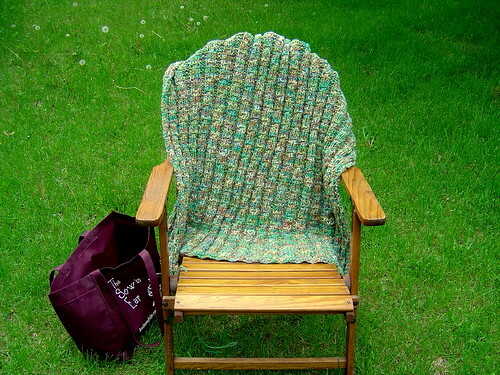 I love this pattern, and want to make it with Vanna White Baby which is a medium weight worsted yarn. It appears to be twice the width of the Caron Simply Soft so I am not sure how to proceed. I am afraid if I double it the blanket will be too bulky. If I use only one strand, I think the size 13 needle will leave the holes too large. Has anyone used only one strand and what size needle did they use to get the same dimensions? Thanks for any insight! The version I knit was with Hobby Lobby I Love this Yarn!, and it is similiar to Vanna’s Choice Baby. I held 2 strands together to achieve the size blanket in the bottom photo. I have given it away, so I can’t measure it for exact dimensions. If you choose to create a blanket with a single strand, I would use a US size 6-9 needle (4 – 5.5mm) and you should cast on more stitches. Keep in mind the number of stitches need to be divisible by 6. I hope this helps 😀 Happy knitting! 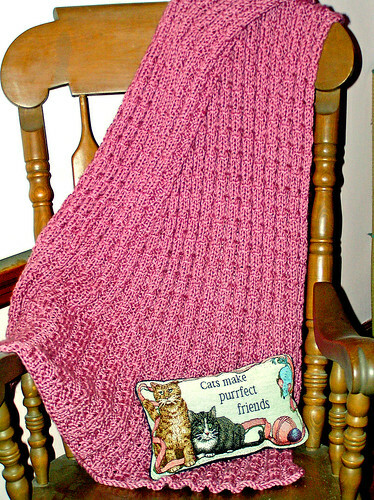 I love this blanket; I’m making one now, and have another scheduled! I do not understand the direction YIF or YIB. Do I just put the yarn there or do I do a stitch? Here is a great instructional video. If you are still having problems after watching it, let me know. Happy knitting! It looks wonderful 🙂 Can’t wait to see your finished project! Ella Rae Amity Print #210 Blue, Yellow, Peach. Knitting two as one. It was a bit slow going at the start but once I start not have to think about the pattern to much things sped up quite a bit. It’s beautiful ❤ You did a fabulous job! Sorry, Our wool is done in ply so when you say bulky , what ply are you talking? 10 /12? And could I do it in a 6 or 7 mm needle (US 10/11 ) ? Also when you say 2 strands, then i could use 2 x 4-5 ply but different colours or the same colour ? and you use them together? My apologies, I can knit but I haven’t for ages and the american terminology is a little different, I think we use more British….. I shall eagerly await your reply and then I will dive in!! Would not 2 strands of worsted make it very bulky? It doesn’t look bulky. we tend to use 8 ply here, so would 2 x 8 ply be ok? still though on size 9 (13 us) needles? Thank you for such a wonderful pattern. I am starting it tonite! I had one question when it says to “bind off on a row 2” does that mean to finish row 2 and then bind off or does that mean finish row 1 and then bind off following the pattern for row 2. It means finish row 1 and then bind off following the pattern for row 2. I really like this pattern. I made one baby blanket and now I’m using the pattern to make rugs out of t-shirt yarn. I’ll post a picture soon on my blog. http://www.career2homeschoolmom.blogspot.com. I love your finished projects!